1 Post box is used for starting new moots. Click 2 help to learn about post formatting options. 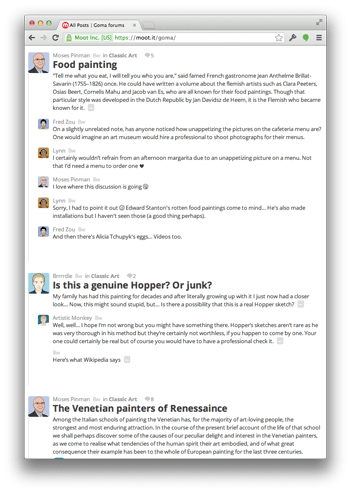 3 The preview area lets you see what your post will look like. 4 A moot consists of the seed post and all the replies to it. 5 The seed post can have a title. 6 The info area shows the poster's profile picture and name, how long ago it was posted, 7 speech bubble icon how many replies there are, 8 like icon how many people liked the post (when that includes you, the heart icon is pink), 9 watch button (pink when the post is watched by you, meaning you get a mail notification when a new reply is posted on the thread while you are away), 10 remove icon with time counter (for your own posts for 2.7 minutes after posting), and 11 mark as spam icon. 12 Replies only have the body text and no title. 13 The reply box is shown under the replies. 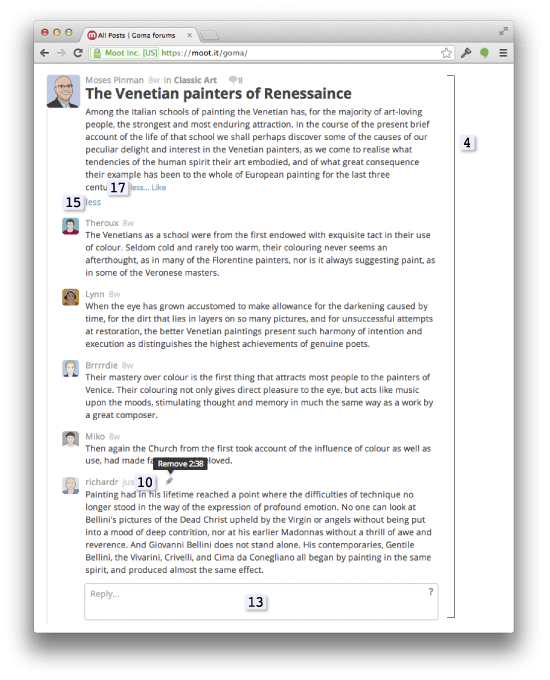 14 The speech bubble shows how many older replies are hidden from the view, while 15 Less allows you to hide older replies. 16 ... indicates that the post is collapsed; click to view the entire post. 17 Less... allows you to collapse it again. Text can be italicized by adding "_" at the beginning and end of the text to be italicized. You can also bold single words by adding "*" at the beginning and end of the word to be bolded. Code snippets and other bits of text are rendered as monospaced text when placed inside backtics (`). 19 Links are automatically formatted to hide the "http://" part, and for some of the most popular websites, to replace the name of the site with an icon with the site's logo. 20 Avatar is the profile picture either uploaded by the user, or taken from Gravatar or Facebook. If no avatar is uploaded or found, the default avatar is shown. A new picture can be uploaded by clicking on the avatar and choosing a file from the computer, or by dragging and dropping the file onto the picture. 21 Username is an ID for the user containing a minimum of 5 lowercase characters, numbers or a hyphen '-'. Username cannot be changed later. 22 Display name is shown on all user's posts'. 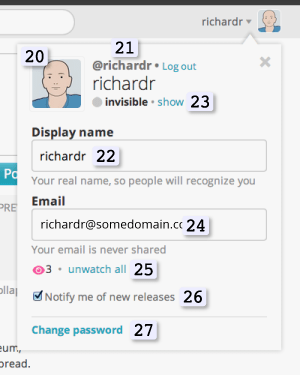 23 Online status (shown in the Online users area) can be hidden and shown. 24 Email is used for sending mail notifications for new replies on watched moots, newsletters, and password reset. 25 Watched moots count is shown here, with the option to unwatch all. 26 Notify me of new releases When this is selected, you will receive occasional newsletters on new Muut releases. 27 Change password You can reset your password here. When clicked, you get prompted for the old and a new password. The notification at the bottom of the page pops up when there are new posts. 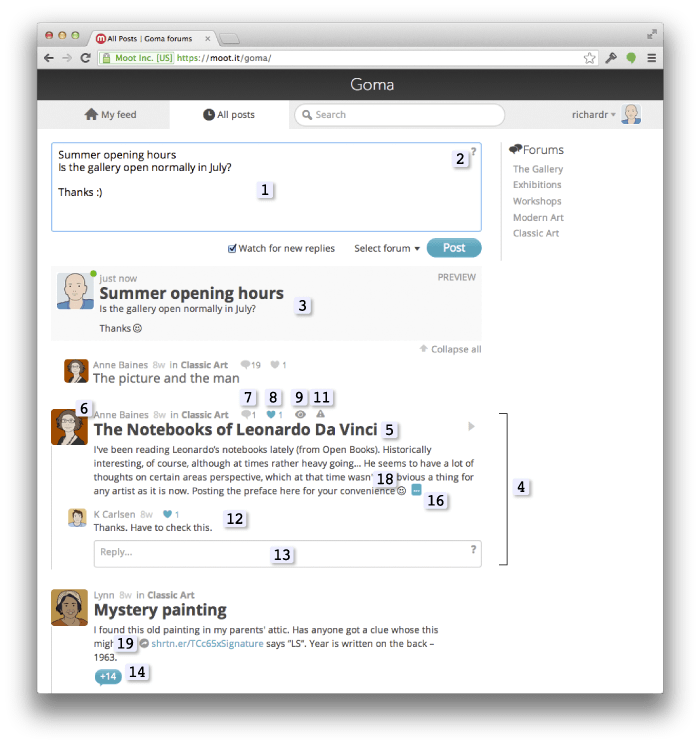 We take discussion very seriously, and we are proud to say Muut is a text-only discussion platform. Give people a chance to post pictures, and you'll see lots of them, at the expense of the discussion. In a body of text, a picture, even stamp-size, will draw all of the attention to itself. That said, we have nothing against 3rd party plugins. If you need pictures, there's nothing stopping you from using a plugin, or developing one, to enable posting them. 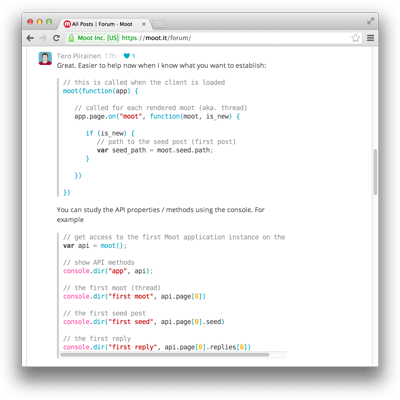 We will document and publish our API once we are out of the beta phase.